User's Guide to retaining walls, patio walls and fences. Learn tips and trick on installation, outdoor living ideas, and learn what and who Allan Block is all about. Get to know us and ask your construction questions here. 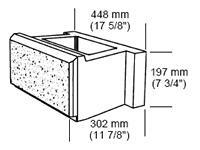 Most Allan Block retaining wall units have an average depth (front to back) of at least 10 in. (25 cm). The 10 in. 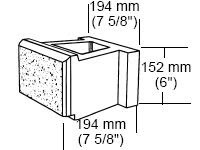 (25 cm) minimum depth of facing unit is recommended because segmental retaining wall units of this depth or greater have a proven performance record while in service over many decades. This recommendation also recognizes that as the unit depth decreases, so does the stability of the facing, particularly overturning resistance during construction or while in service. Allan Block is working to achieve our industry initiative of Zero Wall Failures. With our Best Practices Manual and experience in the industry we are trying to expand the knowledge base for the design of segmental retaining walls (SRW's) by communicating and educating the professionals in the industry. To see the full Best Practices Manual, visit allanblock.com to download today and keep an eye out for more industry Best Practice recommendations here. Always Better Experience - Allan Block. Picture Window theme. Powered by Blogger.